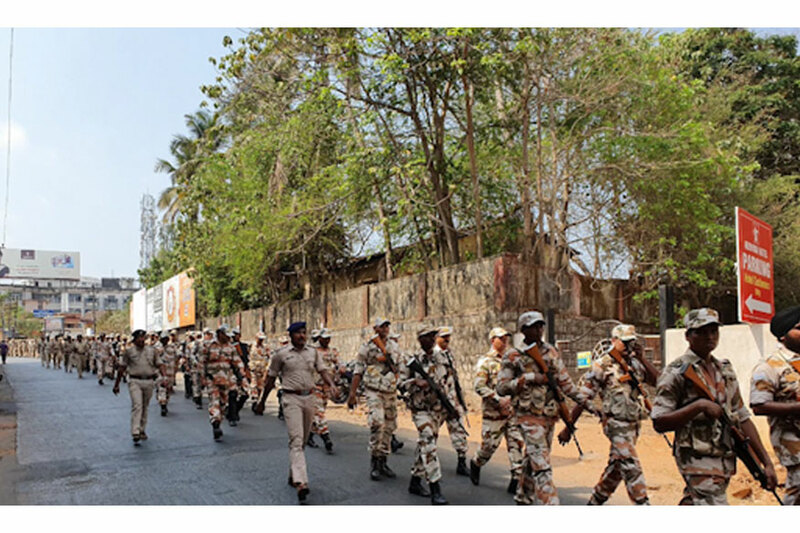 Udupi: Ahead of Lok Sabha polls, scheduled to be held on April 18 in the district, the Udupi district police along with ITBP (Indo-Tibetan Border Police personnel) conducted a route march at various places in the city to assure the citizens of free and fair polls. Nearly 100 Indo-Tibetan Border Police personnel along with Karnataka State Reserve Police (KSRP), District Armed Reserve (DAR), Indo-Tibetan Border Police and Udupi Police participated in the route march held on Monday April 15. The route march commenced from Jodukatte and passed through Big Bazar, Old taluk office, Diana Circle, K M Marg, Service bus stand, Kidiyoor Hotel, City Bus Stand, Kalsanka, Kadiyali and culminated at MGM College, Indrali. Similar route marches will be held at various places in Udupi district like Karkala, Hebri, Padubidri, Bajegoli etc.